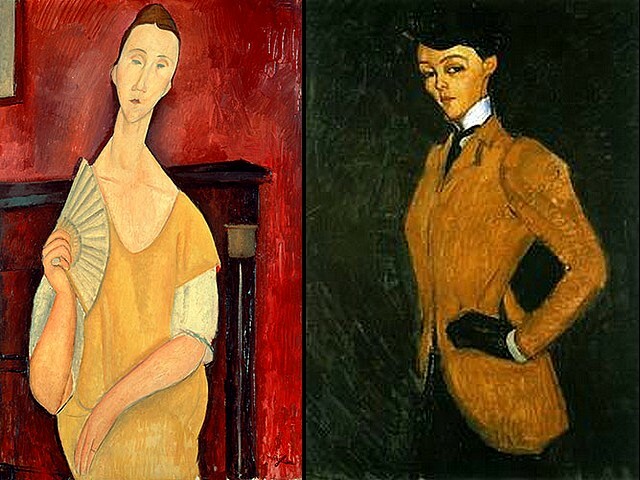 'Lady with Fan' (1919, 'Woman with a Fan Lunia Czechowska', oil on canvas) and 'Woman in Yellow Jacket' ('The Amazon', 1909, private collection), paintings made by one of the most popular artists of the 20th century Amadeo Modigliani. The 'Lady with Fan' ('La femme a l'eventail') has been stolen overnight on May 19, 2010 from the permanent collection of The Museum of Modern Art in Paris, France together with another four well known masterpieces of Pablo Picasso, Henri Matisse, Georges Braque and Fernand Leger. 'The Amazon' is the first paid portrait bought by Dr. Alexandre.